At the beginning of the 20th century, new Orthodox churches arose on Hiiumaa. 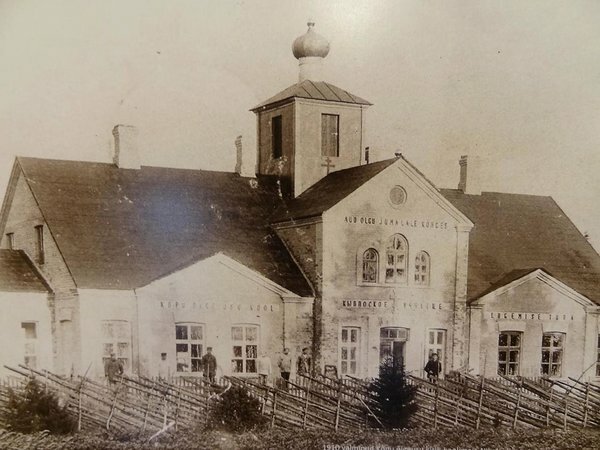 A unique church was built in the years 1907-1908 in Kõpu village – a schoolhouse, which on June 21st, 1909, was consecrated in honor of the glorious apostle St. Andrew the First-Called. In the original church/schoolhouse building, the north wing was occupied by the school, the center by the church and the south wing by a reading room and the living quarters of the parish clerk. The church is a striking example of a Russian Orthodox church in the neoclassical style, of which the original exterior, building size and architectural design elements have been preserved. The only loss has been the onion-domed tower on the center of the building. There are no other such multifunctional buildings (school – church – reading room) in the neoclassical style in Estonia. Since 2007 the local village society Valguskiir, headed by Harda Roosna, has been at work restoring the building.